This month's session was a tough call for me, since "session beers" are a large and somewhat vague category, and there's no way to really narrow down artwork. So I did what I always do when I have session questions: I consulted Lew Bryson's Session Beer Project. I mean, it is Philly Beer Week now, and Lew is the foremost appreciator of session beers, so it seemed appropriate to search for beer artwork there. A session beer, for those who don't know, is a low-alcohol, high-taste, inexpensive beer. It's something of a lost art in this age of ever-hoppier arms races for the biggest beer possible. The first thing that piqued my interest there was a PBW-appropriate reminder that Yards Brewing Company's Brawler is 3.8%. Yards is, of course, in Philly, and in the show, so let's start with them. 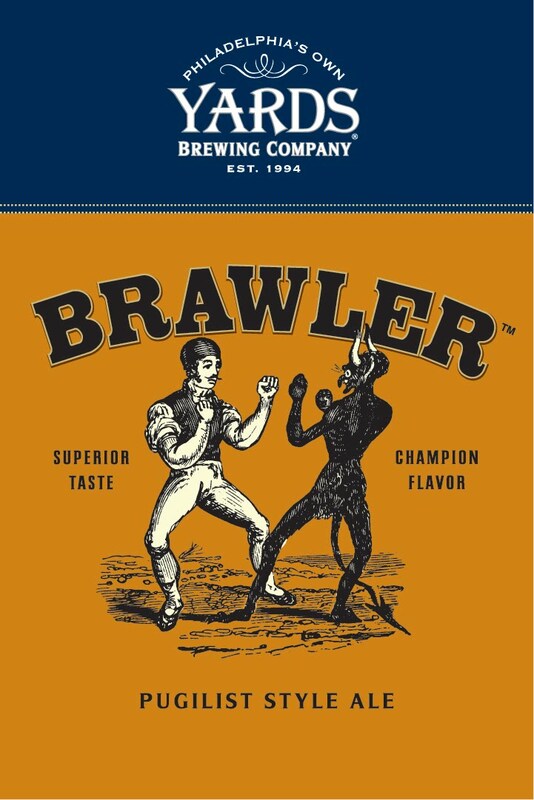 As you can see, the brawler features an old-style boxer versus a demon. This fits with Yards' early American style in their art. In this particular case, it highlights the virtue of a good session beer, which is a punchy flavor (that's more than a bad pun, it's actually descriptive of what big flavor from low-abv beers is like, in my opinon). Session beers are also something of a throwback style, so this is totally appropriate. So the gargoyle is floating, but still glaring, hinting at the intense flavor of the beer. I love big IPAs, and I like Stone's beer a lot, but Levitation might be my favorite offering by them, because it was such a departure for the San Diego brewery. I can't remember ever getting more flavor for a 4.4% abv beer that costs $4 at a bar. And lastly, also via the project, I see that there is a new session-only beer company, Portland, ME's Notch. I like the theme, a fairly masculine color red-black palette and Western style lettering, and I like the little notch in the N that looks a little like it got shot. 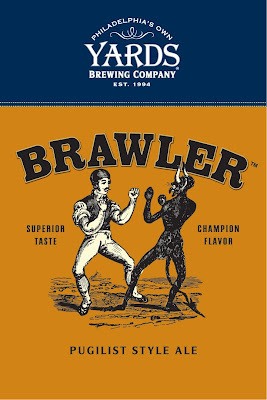 Honestly, though, I wish the branding were a bit more exciting, not because I dislike it but because my first thoughts on seeing the Western style design were that it was too similar to the contemporary MillerCoors effort Batch 19. Not that too many people are likely to confuse a Massachusetts session brewery with a macro launch, but I think it highlights one of the challenges of session beer. The fact is that it is easy to differentiate a 10% double IPA or a robust porter from a new offering by InBev, because they don't taste similar. But a low-abv, low-cost, high-flavor ale sounds a lot like it could be a slogan for whatever macrobrewery product is new this month. Oversimplistically, session ales are craft beers aimed at swill drinkers, and Batch 19 is swill aimed at craft beer drinkers. In these cases, brand confusion is an even bigger pitfall, and so art and design becomes an even more important distinguishing factor. Consequently, brewers like Notch are walking a line between an image that is approachable and one that is distinctive. In this case, I hope the stroke of bad luck that Notch ran into with similar design by a high-powered competitor doesn't hurt them; I'd love to get some Notch in PA. After a month, they're doing great, and new craft-esque offerings by macros have largely tanked (Bud Light Wheat, I'm looking at your crappy sales numbers), so my money's on Notch. > "session ales are craft beers aimed at swill drinker." I beg to differ. Deserted on a tropical island stocked with nothing but macro swill, I'd sooner go about devising--Gilligan Island style--my own desalinization plant for hutbrewing purposes. Or see if you can use coconut juice as strike water. So when I say I'm a huge fan of sessionable beers, it's just because I'm a super light weight. But believe me--Black Tuesday, Wooden Hell, Rodenbach Grand Cru--I always love me some huge, legendary beers. That sentence I wrestled with before, during, and after posting. As I tried to make clear, I think of "swill" as a non-pejorative term for light, easy-to-drink beer. I like lots of things I would call (with tongue firmly planted in cheek) swill. I live in PA, so I love Lager. I lived in Mexico, and I heartily enjoy many of that country's numerous swill options. So you're right in the sense that Notch Session Ale and MillerCoors' latest beer have basically nothing in common, but my point was the function is similar enough there might be some risk of brand confusion.